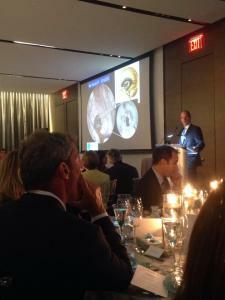 Dr. John Kestle received the Leadership Award at the 2014 Hydrocephalus Association Vision Dinner in New York City on Thursday, October 16, 2014 for his leadership in hydrocephalus research and advancing treatments. Dr. Kestle’s role in past multi-center trials and his founding of the Hydrocephalus Clinical Research Network were cited as examples of his vision and leadership in the field of hydrocephalus. Dr. Kestle is pictured here giving the audience a brief overview of some of the past and current work of HCRN including current research into Endoscopic Third Ventriculostomy with Choroid Plexus Coagulation.